@Voice Aloud Reader for Android - Free! Free Android App - Now with PDF support! @Voice Aloud Reader reads aloud the text displayed in an Android app, e.g. web pages, news articles, long emails, sms, PDF files and more. Universal build for all devices, big, size about 32 MB. Download if you don't know which processor your device has. For Intel processor devices (x86), for emulators on PC/MAC, Chromebook devices with Intel processor etc. Do you need to run @Voice under Windows? Read this. * Click "Share", "Send by Email" button or menu item in any app to send text you read to @Voice Aloud Reader for aloud reading over speakers or headset. * If "Share" is not available, copy text in other apps and paste it into @Voice for aloud reading. 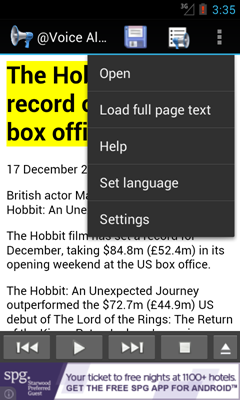 * Open text, PDF, DOC, EPUB/MOBI/FB2 or HTML files from Android file system for reading aloud. * Easily add saved Pocket articles to @Voice reading list - in Read List screen, press Menu - Add articles from Pocket. * Pause/resume speech as needed with wired or Bluetooth headset buttons, plus click Next/Previous buttons to jump by sentence, long-click to switch to the next/previous article on a list. * Can automatically recognize the language of an article and use appropriate TTS voice, if available, or set your preferred voices manually with "Select language" menu item. The full Internet access is needed because the “Share” function from web browsers and any news reading apps I tried, sends us only the URL address (http://something...). They do not send the full text of articles, so @Voice has to download the article from the Internet to be able to read it aloud or save for later reading. Only by using Copy text function in one app, and pasting it in @Voice, or by saving the full text in one app to storage and opening a file in @Voice, you could avoid Internet connection, but this is not very convenient. PLEASE send me your suggestions for improvements and bug reports welcome - send them to the email address listed on "Contact" page. Thanks and have fun! And a BIG THANK YOU! to Ilia Prokator for sending me the idea for this app. * Stability and performance improvements, Android Q Beta 2 compatible. * Trying to fix TalkBack saying repeatedly "Service @Voice" on some phones. If you experienced this problem before, please tell me if this update fixes it for you. * Long-press a word, then press Play button - app starts reading from that word, not start of the sentence. * For TTS engines that can highlight the word read aloud (currently only Google TTS under Android 8 or higher), pause reading - resume, reads from the last read word, not start of the sentence. * Better help in installing new Text-to-speech engines and voices. * New bookmarking - arbitrary selection may be bookmarked now. Bookmarks can be exported to a text file with the complete text of the bookmarked range, and imported back if needed. * New options in Speech settings: START tab - choose to start reading from top of screen, if last read aloud position is behind, and HEADSET tab - ignore Next/Previous (or FF/Rewind) buttons from headset when reading is paused. Should help for problems with certain car stereos. * Restored asking for Storage read/write permission at app start, if it was not granted yet. Previously asked when using Open file function, but some users would send files to @Voice from other apps without every using Open button, and were getting cryptic error message only. * @Voice has now a "Reload" button on article pages that did not download. * If error articles were added to a reading list, you may now use "Reload error articles" on the menu to try to reload them. * Added "Reload all articles" to the reading list menu, to reload all HTML articles. If only some need reloading, prepare first a smaller reading list with them, then use this function. * Modified handling of very long web pages and HTML files, trying to save memory and prevent some out-of-memory crashes. * Finally figured out what caused crashes on OnePlus One phone with Android 6.0.1, and a few other devices - Google's new App Bundle format for uploading apps to Google Play. Reverting to the old APKs for now, which works fine. * New options on Pauses tab of Speech settings - pause for the same duration as it took to read aloud a sentence or paragraph, or percentage of it. * Improved sorting of articles on reading lists and file names - numbers in names are taken into account correctly, e.g. "Article2" will be now before "Article11", not after it. * Added "Change voice or language" function also to the Settings menu - many users could not find it on the expanded bottom control panel. * Added instant sentence translation option on single or double-tap, via Google Translate app. Enable if needed under Settings menu. Works best in split screen mode on Android 7 and higher. * If absolutely necessary, you may long-press the round (>) button next to speech speed slider to increase the upper speed limit the slider allows. What a TTS engine will do with high-speed request is beyond my control. * Better single letter abbreviation detection for Russian language. * Fixed some file association to open from file browsers files of type .fb2, .fb2.zip, .azw3 etc. * Edit speech items can now be individually activated or deactivated with check-boxes on the list. There are also options to activate/deactivate all on the menu there, and delete all inactive if necessary. * Fix for "end of part" info for ebooks and other long files to have the same text background and color as the rest of the pages. * Long press the X button at the bottom of reading list screen to delete an article permanently at once. It will be also removed from all reading lists that way. * Added @Voice Network Library Plugin to download books from online book catalogs published in OPDS format. * When running under TalkBack, full screen ads are no longer shown to avoid user confusion. * Fix - working around a bug in newest Android WebView control, hanging or crashing the app under TalkBack. * Added option to reset "Open by default" setting to Setup screen, and warning user if a file of some type is opened by default, with option to reset. The warning may be turned off. * Reading time left is now shown at the bottom status line when you start reading aloud. It's updated after each sentence is finished. * Info panel available from "i" in circle button on the menu also contains reading time estimates. * You can pull down the info panel by swiping down from the top toolbar of @Voice app, and you may also expand the bottom control panel by swiping up from the bottom row of buttons. * Fix: Plain text indented with spaces did not show correctly. * Fix: Superscripts in ebook files found at end of sentence formed part of the next sentence, causing trouble with speech replacements. Added option to start/stop speech when shaking device horizontally. Enable under Settings - Speech settings. Several important bug fixes and performance improvements. Highlighting of spoken words is now possible under Android 8 and higher, with some Googe TTS voices. Other TTS vendors may implement the functions needed for this in future. May be turned off under "Screen and sleep timer settings"
Added text hyphenation option, it's turned on by default. Can be turned off or on under "Page look" (T+/- button on top), TEXT tab. Fix for some FB2 files still not opening correctly. Added EXPERIMENTAL feature to show active links in web articles. Enable under menu - Settings - Share icons, text and reading list. Added OpenDyslexic fonts to the T+/- font selector. At this time these fonts exist only for Latin alphabets. Edit speech list - long press up or down arrow button to move selected element to top or bottom of list. Many other fixes and performance improvements. Added option to deactivate page turning with the volume rocker keys, under menu - Settings - Screen and sleep timer. Splitting very long HTML files again for faster operation and to avoid out of memory errors - this time much more robust algorithm than the previous attempt. Better text extraction from HTML sources that have text inside <dt> and <dd> tags. New - option to auto-add to list an article, if web address is copied (Settings - Share icons, text and reading list). E.g. in Chrome, long-press a link, then choose "Copy link address" to auto-add that page to reading list. Fix - No Ads license was not working for a few users. In long multi-part document (TXT, DOC, PDF...) to jump directly to part N, press top-left logo and type part number. Bottom progress bar and message now show both total progress in book/long doc, and current chapter/part progress. The notification shows now only total progress. Accessibility improvement - under TalkBack a "Bookmark and reference" button shows on top, for easy bookmarking etc. Upon long-press selecting a word, when the "reference" toolbar appears, press the 3-dot menu - Edit speech, to edit that word pronunciation or replacement. Added "Find" function to the list of speech replacements. Better abbreviation handling to avoid stopping sentences on abbreviations ending with a dot. Many important bug fixes and performance improvements. Fix for media button press on headsets problem on Android 8 "Oreo"
Full sync between devices via Google Drive, availabe on main menu. Requires installing @Voice Sync Plugin from Google Play. Notification change: changed the "Stop" button, which really exits @Voice app completely, to a more standard X in top right corner. Optimizations in text replacement for speech code, some people try to replace several thousands of words now in each sentence, so it must be as fast as possible. Export bookmarks function added to Bookmarks screen menu. Exports marked sentences in TXT format. Fix: Share Add to List while @Voice was reading aloud something else, would stop speech. Fix: reading aloud stopped after pressing "Back" button to close @Voice screen, when next part of ebook or long text was loaded. For EPUB files that provide page numbers navigation, added "Pages" tab to TOC screen. Added warning about discontinue of Dropbox sync soon, due to changes that Dropbox company introduces in their SDK. Fix: when speech stopped with sleep timer function, reading position was lost. Fix: when stopped with sleep timer and screen off, would sometimes resume speech after a few seconds. Fix: with "Start talking at once" option selected, when starting a new article or chapter, would repeat the first sentence twice, then highlight out of sync with speech. Sort options added to the Reading List screen, to sort alphabetically, by file size or date, ascending or descending. New file "Open" screen - flat list of ebook and article files in known folders. Can switch to the old Browse by folders screen from the menu. In German texts numbers followed by a dot don't end sentence now. Sync with Google Drive is now done from a separate plugin app, so the main @Voice app does not require identity and contacts permissions anymore. Android 6 and up: trying to resume speech, if interrupted by TalkBack or other voice announcement. Fix - would not read aloud from epub files or other HTML sources if the source file did not have <body> tag. Bug fix in opening some EPUB files. Fixed a few rare bugs reported since v.9.6.5 release. Implemented back/forward navigation (press menu button to find arrow keys). Note, they will start working if you navigate from the current article or chapter elsewhere, e.g. to the next article/chapter, jump to read a footnote etc. Better handling of EPUB3 ebooks with one huge internal HTML file, which previously could crash the app or make it load text for a very long time. Accessibility improvements for visually impaired users. Fix a problem with sharing articles to @Voice from New York Times web site or app. Many internal changes to make things run smoother and faster, use less memory. Support for Bookshare.org - find any book in their catalog, then "Share" the book page to @Voice, and it will offer to download it. Google Drive support will now download any article file we can read from @Voice folder on Google drive. Sorting our the characters in right-to-left scripts (Hebrew, Arabic) into correct order, when decoding PDF files. Need input on how this works. * New desktop Chrome browser extension to add articles to @Voice with one click from your laptop or desktop computer. Install it in Chrome browser by search in Chrome Web Store for "@Voice Add to List". * After installing the extension and adding some articles with it, go to any Reading List, press menu - "Google Drive sync". * Bug fixes and performance improvement. * Play gong sound when recording and article to a sound file, and recording is finished. * Pocket sync - the "Quick" method is now disabled on devices where it won't work. * Small change in Reading List handling - when article is 75% or more finished, and you press a button to load the next article, it's marked as 100% finished, which will make auto-archiving easier. * Some buttons larger and speech sliders hidden, when TalkBack is used. * Record sound files with continue to next article/chapter: option to combine chapters into one sound file. * Zoom out text with "pinch" gesture, and you may scroll without worry that upon reading the next sentence the view will scroll back. * Added Exit function to the menu, the back button just goes back to previously used app. Exit will completely stop the app and its service. * Restored ability to use network voices, this time a check-box on the voice selector screen, with a warning. * Resume speech on volume up was starting @Voice reading also when it was not desired, e.g. when upping volume during a phone call. Now it only works if @Voice screen is visible. * Removed option for network speech gen - a lot of trouble! * Removed swipe off notification when not talking aloud - caused problems on many devices. Use the stop button instead. * Some changes in PDF text extraction that provided better results in my test cases. * Restored skip to the next article by long pressing the Next button on a headset, for headsets that support long-press. * Fix for selecting folders and files in @Voice - the folder hierarchy was not traversed above any folder where the app had no read access. * If reading aloud is stopped, you may now dismiss @Voice notification by swiping it out. * Fix for extracting content from NY Times articles. * Added option to manually crop of PDF pages to exclude unwanted text, e.g. page numbers, headers, footers, footnotes, sidebars etc. - requires installation of @Voice PDF Crop Plugin component. * Added option to repeat sentences any number of times, turn on under Settings - Speech settings, or long-press the "Repeat" button at the bottom to get there quick. * Option to use dark background and controls with any page colors selected. * Other small enhancements and fixes. * New functions under Reading List menu: "Remove finished articles" and "Delete duplicates"
* Improvements in text import from PDFs, where characters are composed from separate components, like basic letter plus diacritic. * Correctly displaying Chinese & Japanese vertical text under Android 4.4 and higher (on older versions changes to horizontal orientation). Also has an option to switch from vertical to horizontal mode, if the original document specifies vertical. * Improved text segmentation into sentences for Chinese and Japanese. * Many smaller bug fixes and performance improvements. * Fixing content sharing issues from MS Word, Adobe PDF Reader etc. * Another sharing fix - from Google Chrome or Flipboard, if @Voice was not running in the background, one had to press "Share" twice to work. * Correct issue with sharing articles from the new version of Flipboard. * Work around for some web pages blocking content with a message about AdBlock, even if AdBlock is not installed on device. * Fixing issues with adding to list web links redirecting to PDF or other type files. * Additional options to improve text import from PDF files. * The options screen for above is displayed each time you open a PDF by default. * Better text formatting in some special PDF cases. * Faster horizontal scrolling mode - pinch to zoom out, then scroll quickly through all the pages with swipe gestures or the slider at the bottom. Or quickly swipe pages 3 times to switch to this mode. Tap any page to go back to normal reading. * Added option to remember permanently the sleep timer setting. * Options to remember speech rate/pitch for each language or voice. * Selecting eBook from read list menu opens the text where last left, instead of TOC. * Bookmark feature added. Long-press any word to show the "Reference" toolbar, then press the bookmark icon. To go to previously added bookmarks, use "Bookmarks" item on the menu. * Next/previous buttons in notification and lock screen jump to next/previous article on list, when speech stopped. * PDF text import code modified to avoid running out of memory on huge PDF files. It's slightly slower than before though. * When saving web pages for reading/listening later, will now save simplified HTML with relevant text already extracted, to load saved files faster. * Extracted more functions to the toolbar on top, making them available with one click. * New look, more conforming to "Material Design"
* New ebook like reading mode with screen size "pages" and horizontal scrolling. Switch under menu - Page look. * Sliders for pitch, speed and volume now allow exact digital value selection. * Updated German translations – thank you, Peter! * Sentences were not split correctly if the source contained &nbsp; character after sentence terminating characters. * Several bug fixes and performance improvements. * Other small improvements and bug fixes. * Fix: was crashing on extracting text from some PDF files. * Fix: should no longer stop speech, when non-audio Bluetooth devices (e.g. FitBit) periodically connect and disconnect. * Some web pages that previously loaded very slowly, now load much faster. * Added "Show all files" option to the menu on "Open" and "Save" screens, to view a list of all files in the folder, even if they don't have officially supported extensions. * Fix: was sometimes losing position within an ebook chapter, maybe on other contents too. * Fix: clear contents did not work right and came back with previously opened text. * Reverted to older version of Google Services and their appcompat components. The new versions crash our app on some older devices when Google ads are running. * Even less CPU/battery consumption when Google Ads are running and screen off or @Voice app is in background. * Fixed bug with Dropbox sync, which caused loss of current position in articles and eBooks. Also continuous sync with Dropbox did not work correctly, removed this option - manual on demand sync only for now. * Fixed: in PDF files, some method of making words bold resulted in repeated words in @Voice. * Improved text extraction from several popular web sites and news sources. * Upon requests from many users, added "Record sound file" function to the menu. Records uncompressed WAV files, or compressed OGG with different quality settings. Currently records one article or one chapter of an ebook at a time. * Added warning about using the current IVONA voices on Android 5 Lollipop, as they have a bug and don't work on Lollipop. * Many bug fixes and performance improvements. * Experimental EPUB format support. It's only for reading aloud, no fancy full featured EPUB reader, e.g. does not show pictures, many more features of a full reader are missing. * Double-click on a headset pause/resume button will back-up one sentence, but only if your device is not programmed to handle such double-clicks by the system to do something else. * Several other small bug fixes. * Fix: repeat current article option did not work, if the article was not on the reading list. * Revert to older Google build tools, update to API 21 was a disaster. * Changed how STOP button operates by default: if the app was talking, first STOP press just stops speech. Second exits the app. * Fixing issue of unintended speech start, when paused but @Voice app is still on top, and phone unlocked or similar situation. * Added "pause definitely after each sentence" option to speech settings - useful e.g. if you want to repeat sentences when learning a new language. * On orientation change to to landscape, the control panel at the bottom is now auto-collapsed - else you can see very little or none text at all. * A few rare crash fixes. * Several other rare occurring bug fixes. * Small fix: using "Add to list" share icon will not affect the article last opened in the app. * A correction to PDF text extraction code - trying to fix a rare crash on some PDF files. If you have a PDF file that crashes @Voice app, please email me that file, so that I could fix it for sure. * Headset buttons: next/previous will go to next/previous list article, if speech is paused. Otherwise as before, go to next/previous sentence. * Long press on next/previous navigation buttons at the bottom goes to next/previous article from the list. * Updated Bulgarian, French, Polish, Russian and Spanish translations. * Options to start reading in the background after using "Share" icons. * Reading list screen changed to dark background, to avoid blinding users who use "night theme" in the dark. * Corrections to the handling of "start reading in background" option. * Added some "language replacement" code, for situations when e.g. "Norwegian Bokmål" language is recognized in an article, but installed voice says it's just "Norwegian", without specifying anything else. Now the program knows to use "Norwegian" generic, if Bokmål variant is not avilable. These replacements can be also specified with an external config file if other such needs emerge in the future. 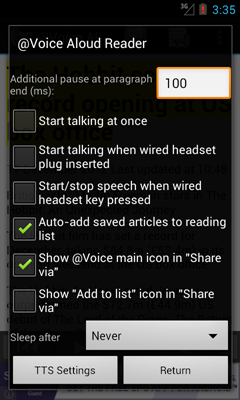 * Added option to start reading aloud in the background after using Share - @Voice Add to List in another app. * Improved "Page look" function on the menu - shows preview of a page, and allows changing font size. * Added code to prevent the reading place loss if program or the device crashes. * Added "Repeat" button to the bottom row. Toggles between no repeat, repeat current article and repeat the whole reading list. * Advanced Pocket sync option on the Reading List screen menu - sync with Pocket selecting articles by tags, favorited status etc. * Added Devanagari Danda character to sentence delimiters. * Better essential text extraction from HTML pages. Minimally slower than the old method, but more accurate. The old method is still available as option. * Speech editor - added export and import of speech files. * Added option to continue reading aloud instead of stopping and exiting, when back button pressed. * Edit text function added to the menu. Lets you edit the current paragraph, use "Clear text" first if you want to type a completely new text. * Several important bug fixes and performance improvements. * Status bar added at the bottom of the article area. Can be turned off under Settings, or by long press on the bar. Shows title, progress, and sleep timer, if enabled. * New option in "Speech and screen settings" to "Keep screen on when reading"
* Fix: if continues Dropbox sync was enabled, could skip or repeat articles from the reading list. * Fix - some web addresses were giving us "403 Forbidden" error. * When exploring by touch, adding % of article complete next to article titles on the lists, so that the percentage completed is read aloud. * Several small bug fixes and performance improvements. * New on Read List menu: "Delete articles not on lists." * New "Page Look" options on the menu - Day and Night themes, keep original page colors or set custom color. * New option under "Page Look" menu - Preserve styles, e.g. font shape & sizes etc. * Reload from browser option will now save selected options and saved passwords for a give web site. * More custom filters for specific sites (Orthobullets.com Orthopaedic Review site, Hacker News), more custom filters in the future. * Fixing an occasional crash when trying to open a PDF file. * Now will open or add to list also PDF files from http links, and better format TXT files from such links. * Fixes for Share - Add to list sometimes not working as expected. * New settings, under "Text, Icons and Reading List" section: "For plane text, separate lines by default" and "For HTML, load full content by default". * The same settings can be switched for individual articles or files under menu - "Reload or clear...". Change the options there if you don't like the way a plane text or HTML article is displayed. * Bluetooth device feature is now optional, which will make the app available to about 500 more devices on Google Play. * It is now possible to reload an article from a web browser, for entering passwords etc. See menu - "Reload or clear" - "Load from browser"
* Fix crash on Android 2.x when pasting text. * Fix: sentence highlighting would stop if screen turned off, then on again while the program is talking. * Swipe gesters to show-hide control panel at the bottom, reading list etc. * Added "Edit speech" feature under Settings menu, to change pronunciation of some words, delete unwanted fragments of sentences (using RegEx) and more. * Added "Clear contents" function to the menu, to clear the current text from @Voice screen. * If HTML page declares text encoding different from auto-detected, we let you switch between the two from the menu, to display text correctly. * Made the APK file to download smaller. * Many smaller new features, improvements and bug fixes. * Added "fast scroll" feature - a blue circular button on right, that appears if you touch screen and move it up or down, then fades out if not needed. Touch and slide up/down to scroll fast to any part of the document. * PDF files can be now added to reading list. * Fixed issue with Dropbox leaving incomplete (damaged) files if connection was broken while downloading. * Showing progress bars under article titles in the Reading List, to show how much was read. * Improved search interface, e.g. ending search with "Play" button starts playing from the currently found place. * Sending PDF files from Adobe Reader through "Share" function to @Voice now works. * Pressing "Next" sentence when at the end, or "Previous" when at start, now loads a next or previous article from the list, or provides spoken feedback. * Fixed opening password-protected PDF files from Dropbox app, file explorers etc. * Better multitasking, sometimes was blocking on article loading. * Fixed: could not open files from Dropbox app. * Made possible opening PDF files by a press in Android "Download" area and similar situations. * Now extracts text from PDF files for reading aloud or on screen. Select "Open" from menu and navigate to folder with any PDF files. * Better character encoding recognition for web pages that don't declare encoding correctly. * Many smaller performance improvements and bug fixes. * Long press now also highlights the sentence to start speed from that point, in addition to starting text selection. This makes possible selecting a sentence to start reading from when TalkBack is enabled. * Added character encoding recognition when loading text files. Should now display correct characters even if text is not in UTF-8 format. * For Android 4 (ICS) and higher, added a better lookup of TTS engines, languages and voices. 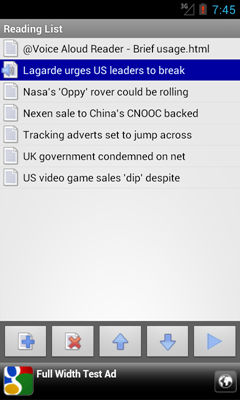 * Added notification to Android notification bar, with the title of currently played article. On Android v.3 and higher it also has progress bar, buttons to start/stop, skip sentences and turn on/off the option to speak clipboard aloud. * Dropbox login was broken if new Dropbox app installed. This release fixes the problem. * More crashes and no-reponses fixed. Thank you for sending the bug reports! * Several bug fixes again. * Fixed English pronunciation of words ending with ST and a dot. * Paste button or menu item now appears even if you copy text as short as 1 character. * Auto-start speech when headset connection option now also works when Bluetooth headset is connected. * Zoom controls added to enlarge text as needed. Can be disabled under Settings. * Auto-bookmarks the last read article, and restores it and the last read sentence when the app is stopped and re-started later. This also synchronizes through Dropbox, if you use this feature. * Corrected a problem with ads sometimes showing even after buying and installing the "@Voice No Ads Upgrade". Sorry about that! * Option to move @Voice folder to another location, e.g. external SD card, if needed. * Dropbox sync now has option to be on demand (when you click the menu to sync only) or continuous. * Option to not exit the app when the on-screen STOP button is pressed, just stop speech and reset position to the top of article. * Dropbox sync! Enable, then build your list on one device, e.g. a tablet, then listen on your phone. Or from your computer, use File/Save As - "HTML only" function in the browser, save to @Voice Dropbox folder, then listen on your phone. * Several bug fixes, including a crash on some long articles from RADIO SVOBODA. * Improved contents extraction from Twitter tweets. * Android package name changed to com.hyperionics.avar - will uninstall the older version upon first run, but preserve any saved articles and reading lists. * Corrected issue with voice change when starting to read the next article from list. * Better contents extraction, loads the main article only and omits navigation etc. from Web pages. * Optional menu to load the full contents of page, if necessary. * Optional "share" icon to just add an article to list. Choose icons to show in Settings. * Added move and delete selected files buttons to reading list "add files" panel. * Swipe left/right to load next/prev article from list. * Billing permission added for future premium/no-ads edition. Double click of headset next/previous buttons to advance articles from list did not work well, changed to LONG-PRESS (about 1 sec.) - much better. Sound divider between articles from the list, speaks article number and total of articles. Option to auto-add saved articles to reading list, on by default. Fixed Open -> HTML file saved from any browser, now opens it in correct format for reading aloud. 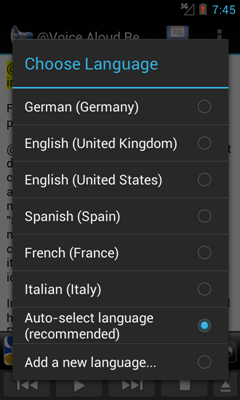 Ability to select TTS voices by language, country and speaker name, e.g. "English (US, Heather)"
Downloading and processing progress bar was sometimes missing. Language recognition is now very fast, made auto-select language the default selection. Faster startup with auto-select language option enabled. Many more bug fixes and smaller improvements. Added automatic language recognition option, but it causes app to start slowly, so it's off by default. Many more improvements and fixes, see yourself! Some HTML style is used in reader window, e.g. headers are bigger, if text was downloaded from a web page. Many smaller improvements and bug fixes. Cosmetic changes - removed title bar for more reading space, fixed "rate" link on "About" dialog. Initial beta-test release. Please download and help us test and improve this app!